This is the first in an occasional series on how tax justice has shaped the history of many countries. In the summer of 1381 England was riven by grassroots revolt. London was invaded and the Tower of London, previously thought impregnable, was over-run by rioters. Simon Sudbury, Archbishop of Canterbury and foremost prelate in the land, was beheaded outside the Tower. The King, young Richard II (pictured here) was forced into making concessions to the rebels, including a charter of rights and a pardon for their actions, which were treasonable under the then prevailing laws. He quickly reneged on his deal. Tax played a key part in fomenting this revolt. Since the 1330s England had been engaged in expensive and unsuccessful war with France. Public finances were in a state of near-collapse. In 1380, the King's parliament, meeting in Northampton, recommended that he should levy a flat rate tax of three groats on every adult in the country. Dissatisfaction with the war, and the imposition of this new tax, coincided with mounting anger amongst working people at the controls on wages introduced in 1351. These controls, implemented at the behest of landowners and gentry, imposed an upper ceiling (but not a minimum wage!) on the earnings of virtually all skilled and unskilled workers. Underlying the worker's fears was the thought that serfdom, which had been considerably reduced as a result of rural labour shortages arising from the Black Death, was in the course of being revived. The combination of restrictions on earnings and a regressive poll tax rankled in the minds of ordinary people, who could see all too clearly that their money was being wasted and powerful elites were prospering whilst they were being impoverished and oppressed. Two figures bri ng the Peasant's Revolt to life. 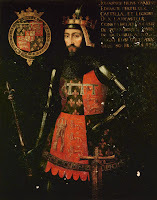 The Duke of Lancaster, John of Gaunt (seen here in portrait) was effectively the King's regent during Richard's childhood and youth. Gaunt was particularly loathed by the ordinary people of London, and was widely blamed for what they perceived as the corrupt practices and cronyism at the King's court. John Ball, on the other hand, had a strong following amongst ordinary people. An extrovert and radical preacher, he was a forceful opponent of the war, called for an end to all forms of serfdom and the land-owning aristocracy, and appears to have had a peculiar talent for inciting people to riot. He openly tormented Sudbury, who prior to 1381 had had Ball arrested and imprisoned on charges of sedition. Whilst John of Gaunt represented all that the people disliked about the remote and arrogant ruling class, John Ball was the people's champion, and a noisy one at that. Things came to a head in the early summer of 1381. Villagers in the Thames estuary region of Essex, east of London, organised meetings to resist the poll tax and protest against the oppressive royal commissions sent to subdue them. The protestors sent envoys into other counties, particularly Kent in south-east England, to rally support. By June the revolt had achieved a huge momentum. Over 60,000 people - a sizeable part of the regional population at that time - congregated at the village of Blackheath outside London, and on 13th June, the festival of Corpus Christi, they stormed the capital. Without effective leadership some of the rebels ran amok. Perhaps understandably, the Palace of Savoie, owned by the hated John of Gaunt, was torched. However, other less discriminate acts followed, including massacres of bystanders, looting and the settling of private scores. 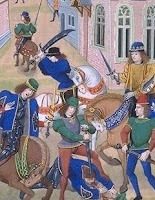 One of the leading rebels, Wat Tyler, believed to be an Essex man, was rumoured to be planning to burn the City to the ground. Faced with the prospect of anarchy, William Walworth, Mayor of London, rallied troops loyal to the King. After persuading Richard to step back from further concessions to the rebels, Walworth set up another meeting at Smithfields, outside the city walls, and duri ng the course of this meeting Tyler was murdered (seen here in a detail from a painting by the chronicler Jean Froissart) and the rebels subdued. The preacher John Ball was also arrested and subsequently hanged, drawn and quartered in the presence of King Richard. Despite vicious repression the rebellion continued in other parts of the country. Ultimately the revolt prevented the re-imposition of serfdom and is credited with setting a pattern for popular rebellion that has shaped class relations in Britain since the 14th Century. Aversion to the poll tax, hated because it made no allowances for ability to pay, triggered what is arguably the first rebellion of English workers against their rulers. But, as Dan Jones argues in his new book on the revolt (Summer of Blood: The Peasant's Revolt of 1381, 2009) other resentments played a part in bringing the people onto the streets. Firstly, the war against the French was costly, unpopular and badly managed. Second, a massive income gap had emerged between the wealthy gentry and working people. The former were seen to be lightly taxed whilst the latter felt themselves to be taxed beyond what they considered just. Finally, oppressive actions by tax collectors and royal commissioners mobilised workers who were already seething about the caps imposed on their earnings. Public hatred of the poll tax never went away. It brought the people back onto the streets of London when Prime Minister Margaret Thatcher tried to re-introduce the idea in 1990. But some of the other bones of contention at the time of the Peasant's Revolt also resonate in contemporary Britain: costly and unpopular overseas wars; administrations seen as corrupt and oppressive; huge wealth and income inequality made worse by regressive taxation. Who says history never repeats itself?